I was looking back at some of the projects I worked on around here last year and the first one that was done in January 2012, along with the powder room at the same time because I am crazy, was the sun room getting painted to a nice light neutral color to replace the green that had been in there for years. The green was alright, but I was ready for something fresh. So funny seeing these old pictures. The floral chairs are gone and most of the furniture has been switched around and/or changed except for the white sofa from Pottery Barn. This was Christmas 2011. I used a maize color slip on the sofa. This was the reveal of the new paint color. The floral chairs were replaced with this pair from Overstock and a new rug was added. This was the summer look and probably my favorite. It will probably go back to a look very similar to this in the spring. Then I switched things up with greens and browns for fall. And so far it still looks like this from Christmas. I think I may keep the red and white for a while. How long do you leave your Christmas decor out? I have always loved your sunroom. Really enjoyed how you showed all the seasonal changes. So gorgeous. Kim I hope the New Year brings you much happiness and year full of blessings. 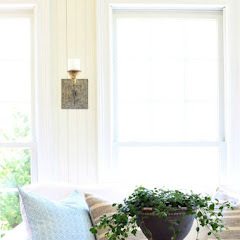 I love all the looks of your sunroom, they all look great........don't you just love how lil changes of color here and there can make such a difference. Your sunroom looks wonderful in all seasons Kim. So pretty! We usually leave up the Christmas decorations until New Years day. It's going to take several days to get it all put away this year, so I've already started with the dining room. Will take the decorations down in the guest rooms today. Hope you had a wonderful Christmas! I love the changes you made in your sun room last year. 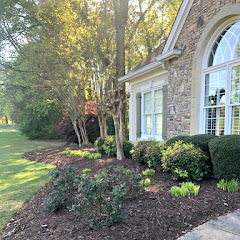 With the white you can just add a little color for any of the seasons! Kim I love the lighter and brighter look!! 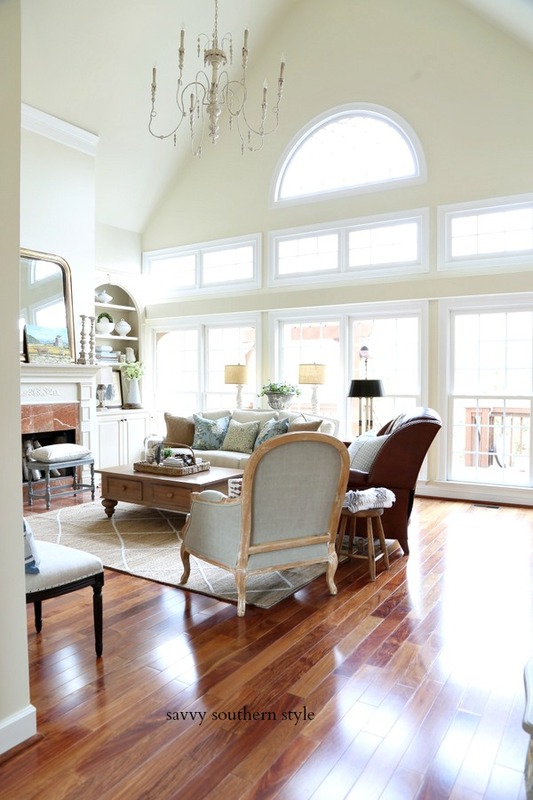 Your sunroom always looks fabulous! Oh I love your new paint colour - your room looks lovely! I love all the looks:) Great variety you come up with. I wanted my Christmas stuff down on Christmas day, but so far I have been out voted and I think it's only because no one wants to deal with it but me. My tree is so tall I need help with the ladder so I am at their mercy! You can do no wrong in that room! We will take down some of our Christmas decor over the weekend but usually leave the tree till New Years Eve or New Years Day. Ithink all of the looks you've had look so nice. the new lighter color seems more versatile though! your overstock chairs are fabulous! I love your sunroom! It was the inspiration for my own. I loved the green, but the neutral opens up the room and lets you tweak when you feel like it........and we know you like to tweak!!! I have to work this year during the holidays, so I don't know when I'll get my decorations down, but I do want to re-organize the way I pack them up. Couldn't find a thing this year! Happy New Year! 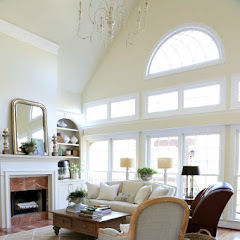 I love your sunroom any color and any decor change..it is just a fantastic room Kim! I do like the lighter color. You certainly have great skill as a decorator! I leave my decorations up through the twelve days of Christmas and take them down on Epiphany, January 5. I love that room no matter what you put in it!!! It is always beautiful!!! I see Dawn was so excited she repeated herself three times! ;>) It looks great, Kim....big change from the original but I did like that green, too. Still one of my favourite all time rooms, Kim. Our decor is still out, I keep it out until I get an urge that it has to go. I have however started making little piles of the non-trees items (stockings, holiday plates etc.) It is a pretty big job so I usually devote a whole day to it. Our 13 year old son is in a hockey tournament for the next couple of days, so it won't be for a few days at least. Wishing you all the best, and good health, in 2013. I usually take the Christmas decorations down on New Years Day and leave some of the wintery ones ( a few snowmen, pinecones etc ) out for awhile. Occasionally I might leave one of the little trees out for another week. I'm so impressed that you have so many different looks for this room. I love the blue and white and the red and white the best. But with that said, all look fab! I loved seeing the transformation of the sunroom...I agree, I love the summer look of the room....you have it so beautifully decorated for Christmas...so I am looking forward to the many wonderful transformations you have in store for us in 2013.....Happy New Year Kim...may 2013 be a very happy, healthy and successful year for you and your family!!! I really like the red and white look. I leave my Christmas tree up until after the first. Thankfully CC will be here to help me put it away. that is such a great room. I leave my Christmas up til Feb...lol!! Isn't it amazing how paint and a few new things can transform a room? I really love the room lightened up a bit. I have the olive green on my walls in the kithen and family room that I am going to lighten up as well. Have a happy new year! 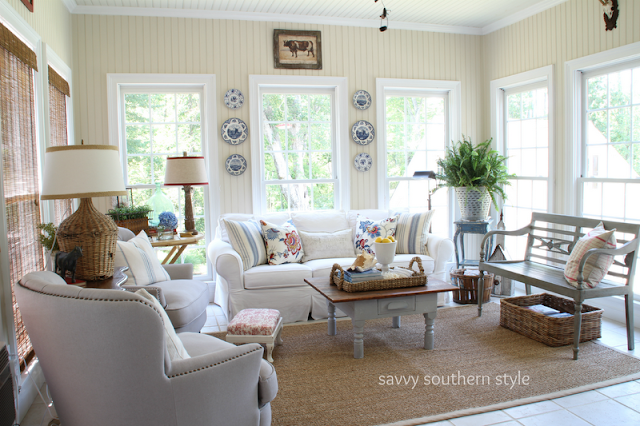 Your sunroom looks beautiful. I love the lighter, brighter look. I usually take down all of our Christmas decor on New Year's Day. That way when the kids go back to school the next day everything is back in order. I remember crushing on those chairs when you first introduced us to them! I love your sunroom! Luv your sun room Kim. My Christmas decor is usually out until January 6th or 12th night. But , I am itching for a new look. Who knows, tomorrow is my last day of work ( I am a Holiday Social worker with the Salvation Army and take applications for holiday assistance and then pass out teh packages , Did that last week), and I will be bored very fast... so I for see a sooner take down this year. 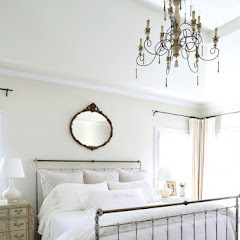 Kim, that was one of the first rooms I fell in love with when I really started reading blogs. Hard to believe that was only a year ago! I have loved it in all of its transformations, but I think I'm partial to the summer look. The pictures and the room are beautiful. Can't wait to see what's in store for 2013! I just spent around ten minutes looking back and forth between all the pictures, looking at all your transitions. Once I get something set in my house, I don't have the energy to change it! I love the looks you created for the different seasons. I love the soft neutral colors in your sunroom now, but I LOVE the red shutters you had in there. Will you ever move them back? Where did they move to? Curious mind want to know! I thought the room look wonderful in green, but then I saw the redo. I love how you have switched out the pillows with the white furniture. Now that I have white slipcovers, I have been thinking about making different sets of pillows and now I know I must do so. Donnamae, I was wondering if anyone would ever ask that question. I have a little metal monkey hanging from the ceiling fan chain so I can easily reach it. When I first decorated this room years ago I had rattan furniture in here with monkey fabric. Kim, I love your sunroom. My family laughs at me because while their bucket lists consist of things they want to accomplish, mine is completely about what I want my HOUSE to accomplish. If I could pick up your sunroom and stick it onto my house, I would happily cross #1 off the list! 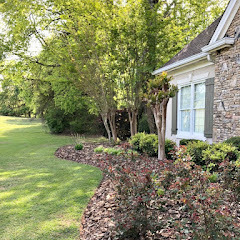 Love the before and after, in addition to all seasons! Just a great room all around. Great post, thanks for sharing the inspiration all thorugh the year. My parents are from Europe so they don't decorate too much too early. After living in the USA they started putting little bits up every week and the tree up the week before - that way it does not feel like too much too keep the tree up through the 12 days, Jan 6th and feast of the Magi. I start to take some of the Santa themed things down before New Years and gradually move the decorations back into storage. Love the changes. Looks sunny and lime a happy place! Took down everything Christmas except the tree and the lights on my huge vase with twigs. It feels better. It's such a stunning space. I love the red and green together. My Christmas stuff will go down on the 1st. I'll be sad to see it go... Happy New Year, Kim! My favorite place in your home. I'm a green girl so I love the green walls. But they look great now as well. Changing out the chairs was a good touch. In regards to the Christmas decorations - I'm usually out of town for the Christmas/New Years week and some surrounding days so my decorations stay up till mid January. Maybe someday I will get crazy and take everything down before I go out of town! I always miss the lights and magic of the decorations so it doesn't bother me to have them up longer. Don't tell anyone, but last year they were up till right before Valentines! 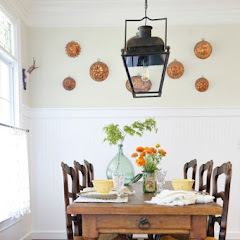 Love the fall look with the brown pillows and green plates…very soothing. I love how accessories can reinvent a space.